Yarmouth has always prided itself on having many generous and hardworking volunteers that contribute so much to our community. 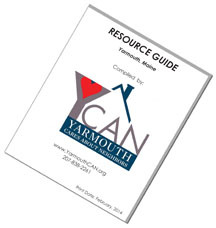 To help us develop additional volunteer positions, YCAN has entered into a collaboration with SMAA (Southern Maine Agency on Aging) to bring the RSVP (Retired Senior Volunteer Program) to Yarmouth. This project is looking to roll out a couple of new programs that we believe will add much to what we are already doing to make Yarmouth a more age friendly community. These programs are a Friendly Visitor Program, Phone Pals Program, and a Handy Helper Service! Our Friendly Visitor Program will have a volunteer visit an elderly resident in his or her home on a regular basis, providing companionship and friendship. No medical, personal care or housekeeping tasks involved. Our Phone Pal Program will have a volunteer provide homebound elders with companionship by regularly calling on the phone in an effort to decrease feelings of isolation and loneliness. Our Handy Helper Program will have volunteers assist people with light household maintenance duties, i.e. : replacing light bulbs, raking leaves, cleaning garage, light painting, gardening. No jobs requiring licensure (i.e. plumber, electrician). We are looking for volunteers for these programs! We are holding two informational sessions about developing these programs. Please join us at the Yarmouth Town Hall Community Room on Tuesday, April 16th from 10-11 am OR Thursday, April 18th from 4-5 pm to learn more. If you have any questions, please contact Yarmouth Community Resource Specialist Maureen Brosnan at 835-9866 orMBrosnan@yarmouth.me.us . See you there! The school community and YCAN are streamlining the way we meet the needs of individuals in our schools by establishing a Facebook group, Yarmouth Emergency Team (YET). The closed Facebook group will address the needs of specific anonymous Yarmouth students (for example, a gently-used pair of boots or a calculator) as requested by the school liaison, and will streamline how we meet emergency needs while providing an opportunity for the larger community to become involved in helping neighbors in need. Please click here for more information, including a link to the Facebook page. And thank you for helping our community! Please click here to see the flyer for this program. It will take place on Wednesday, March 20, 2019 at 10:00 a.m. in the Yarmouth Performing Arts Center at Yarmouth High School. Coffee will be available starting at 9:30, and the program will begin at 10:00. Lunch will follow in the Yarmouth High School cafeteria at 11:30. YCAN is in search of a driver willing to take a Yarmouth woman to visit the Service Dog Project in Ipswich, MA and bring her home. The rider has significant mobility issues due to Parkinsons, and if she qualifies for a service dog (the reason for the trip), it could change her life. If you love dogs – especially Great Danes – your time at the Project will be full of joy and enrichment. And you’d be doing something remarkable for a neighbor. The Service Dog Project Open House takes place every Sunday from 12 – 4:00, so there is flexibility in arranging this ride. This is a large ask, and we understand that. If you find yourself open to this idea, please contact Leslie Hyde at the YCAN phone 207.838.2261 for further details.